Cargas Laftrius was an Imperial healer who joined the Fighters Guild and was sent with Viranus Donton to deal with some trolls in Forsaken Mine, south of Leyawiin. Apparently, something went terribly wrong during the routine mission, as Cargas is one of numerous slain Fighters Guild members scattered all over the mine. 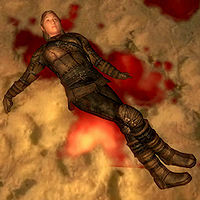 Her body can be found in the dead-end northern section of the first zone in close proximity of yet another corpse that was once Mattius Wotrus. She was equipped with a set of leather armor consisting of the cuirass, greaves, gauntlets and boots. This page was last modified on 26 January 2016, at 03:22.